Prices : £160 -£295. 2 BEDROOMED AIR CONDITIONED GROUND FLOOR APARTMENT.SLEEPS 6.OVERLOOKS POOL/GARDENS. Our apartment is furnished to the highest standards with new leather sofas and a flat screen Tv added recently. Comfortable enough for you to want to stay forever, our apartment is the ideal holiday home in the sun.Family owned and professionally managed .Whether your perfect holiday consists of beach, golf, activities or relaxation, you will find it in villamartin.Only a 10 minute drive from the bustling resort town of Torrevieja. A Golfers Paradise, you will have the Championship Golf Courses of Villa Martin, Las Ramblas and Campomar on your doorstep. The golden sands and topaz blue sea of La Zenia Beach are calling you, come on in, the waters lovely ! All beaches have blue flag recognition for cleanliness and have beach bars.restaurants,sun loungers for hire. The beaches tend to be of golden sand with a safe incline making them safe for children. 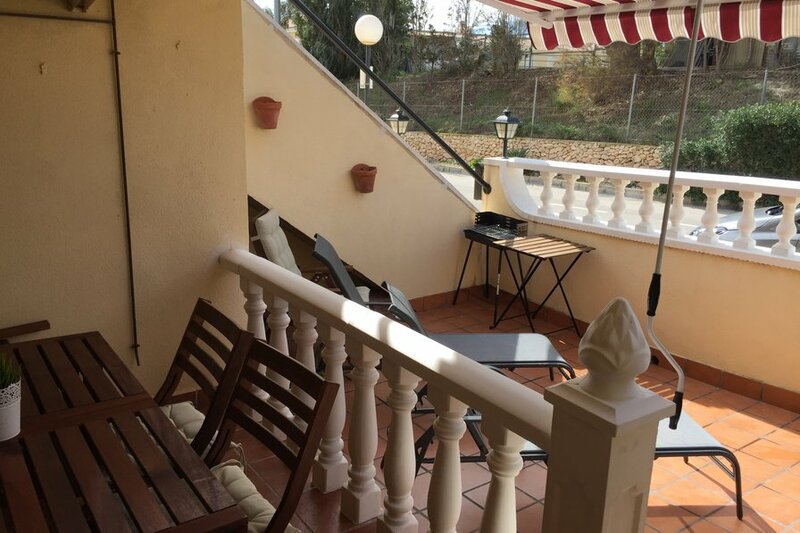 Locally to the apartment there are several options for eating out , villamartin plaza is a 10 minute walk away with approximately 30 restaurants to choose from. Also within a few minutes walk there are several bars/restaurants scattered around in different directions. NEW FOR 2017 ...ADDED GOOD QULAITY PATIO FURNITURE WHICH CAN SEAT UPTO 8 PEOPLE,RELAXER CHAIRS AND SUNBEDS. A SUN CANOPY CAB BE EXTENDED OVER PATIO IF REQUIRED. BBQ AVAILABLE FOR USE. ALL BEDDING FITTED BEFORE ARRIVALTOWELS SUPPLIED...CLEANING INCLUDED IN PRICE.SATALITTE TV WITH ENGLISH CHANNELS,CD PLAYER,HAIRDRYER,MICROWAVE,OVEN,UTILITY ROOM WITH WASHING MACHINE. QUIET FRONT PATIO AREA OVERLOOKING TREES & STABLES.TO THE REAR OF THE PROPERTY THERE ARE COMMUNIAL GARDENS & SWIMMING POOL WITH SMALL POOL FOR TODDLERS.